CSS/ESS have developed a generic database system that can be customised to assist in the storage and management of heritage information. The system uses web, database and GIS (Geographical Information Systems) technologies which allows the input of spatial and non-spatial information. 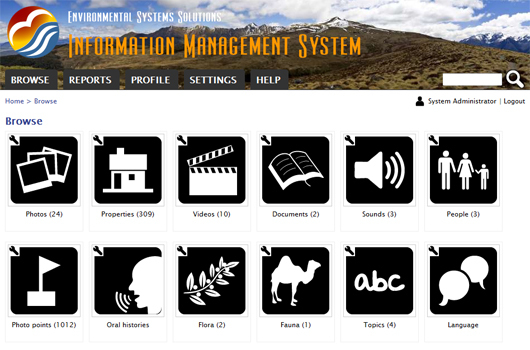 The system is a repository for photos, videos, reports, management schedules, monitoring forms and any other kind of information needing or pertaining to heritage management. Entries made into the system can be related to other pieces of information already in the system, or alternatively to features (e.g. spatial features, general collections). All entries made into the system have permissions. These permissions allow a user who adds information to control which other users can view/edit it. This system is an information management tool that allows people to record, describe and classify features in the landscape using a map. It also allows users to record and classify a range of heritage items that include artefacts, techniques, collections and stories. Once these heritage items are defined registered system users are then able to add a diverse range of documents and other data to describe specific characteristics of those items. For example, after the location of a cultural site is defined using the map any number of photographs, documents, videos, management forms can be recorded. For non map-based collection items a diverse range of data entry forms can also be added. Any information recorded within the system can be shared to groups of users by the person entering the data. Easily design data entry forms that allows users to record and manage photos, videos, documents,reports, spreadsheets etc..